Trees are great for $aving on energy costs. They provide shade in the heat of summer which means less need for air conditioning. 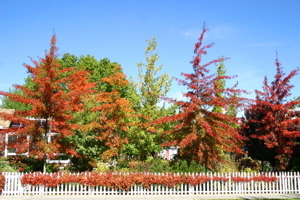 If they are deciduous (meaning they lose their leaves in winter), trees allow for sun exposure during the winter season. Trees add to assessed property values, especially mature trees and fruit trees. Trees are a good investment because they return more benefits than the cost. Trees sustain the long-term environmental health of the community. Trees help moderate the effects of our area’s harsh climate. They help filter the intensity of the sun and they regulate temperature, wind, and snow and rain. Trees provide a natural filter to stormwater and reduce flooding. Trees improve air quality by absorbing carbon and producing oxygen. Trees also filter pollutants from the air. Trees provide habitat for birds and other wildlife. Urban trees make walking places safer as they safeguard pedestrians from traffic. Trees provide screening and privacy. Trees reduce glare and reflection. Trees buffer sound, reducing noise pollution. Trees add to the beauty and peace of our surroundings. Trees contribute positively to our quality of life. Trees can serve as a source of community pride. Studies have shown that forested areas like parks can reduce blood pressure and benefit the overall emotional and psychological health of individuals. Trees help create recreational areas that can be enjoyed by walkers, runners, cyclists, and more. Read more about tree benefits from the International Society of Arboriculture (ISA). Read more about the financial value of trees from the ISA.